Driving in the EU after Brexit. While the words 'Deal' or 'No Deal' are being uttered more in parliament than you'd expect on a Noel Edmonds game show, you need to be prepared if you're planning to drive in the EU after 12th April 2019. Firstly, what’s the latest with Brexit? You could be forgiven for thinking MPs are playing a game of the hokey cokey with the EU in current Brexit negotiations. While the situation is changing all the time, here’s the latest scoop (as of 26th March 2019). Last week, the European Council agreed to extend the Article 50 deadline to the 12th April 2019, after which date the UK will either leave the EU with a Withdrawal Agreement in place, or leave the EU with no deal. "It is increasingly likely that the United Kingdom will leave the European Union without a deal on 12 April." So, what happens if we leave the EU with no deal? Right now, the UK is a member of the EU’s ‘Free Circulation Zone’, which means UK insured drivers automatically have the minimum compulsory insurance in all of the European Economic Area plus Serbia, Switzerland and Andorra, and don’t need to carry a Green Card. This could change on 12th April 2019 though. The Department for Transport have warned that leaving the EU with no deal means that if you drive your car outside the UK to the above countries, you’ll need to take a Green Card with you that proves you have valid insurance. A Green Card is evidence of motor insurance cover for when you’re driving abroad. 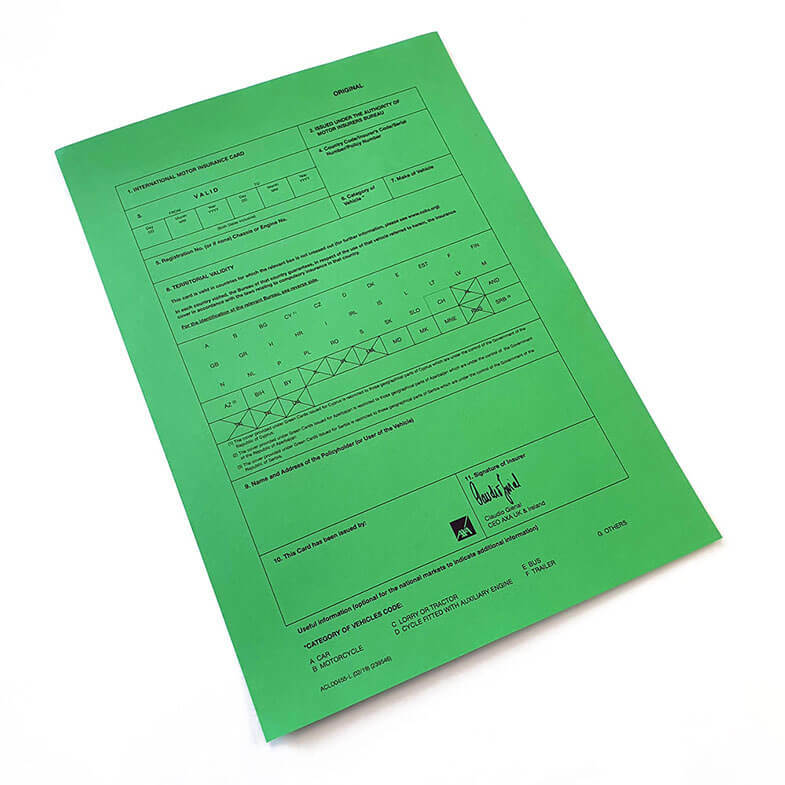 As the name suggests, it’s printed on a green piece of paper and shows which countries you have valid insurance for. The Council of Bureaux (who administer the Green Card across the EU) still insist on drivers having an actual physical green card or piece of green paper with the certificate on, which means that you can’t just keep an electronic copy with you. What are By Miles doing about this? You’ll soon be able to download a Green Card for the car you have insured with us straight from your By Miles app or web dashboard, and print it out on some green paper at home. We hope this’ll help out some people in a last minute rush to sort their holiday packing list. If you're driving abroad imminently and you’re a By Miles member, just give us a call or send us a message using the live chat in your app. We’ll be able to help you get one printed out and sent to your home address. If you’re with another insurer, you’ll need to get in touch with them and request a Green Card. Make sure you leave plenty of time to apply for one, as some insurers are saying they’ll require up to a month’s notice. Still not switched to pay-by-mile? Get a quick quote here. Why are UK drivers paying more for driving less? The simple errors that may invalidate your car insurance.